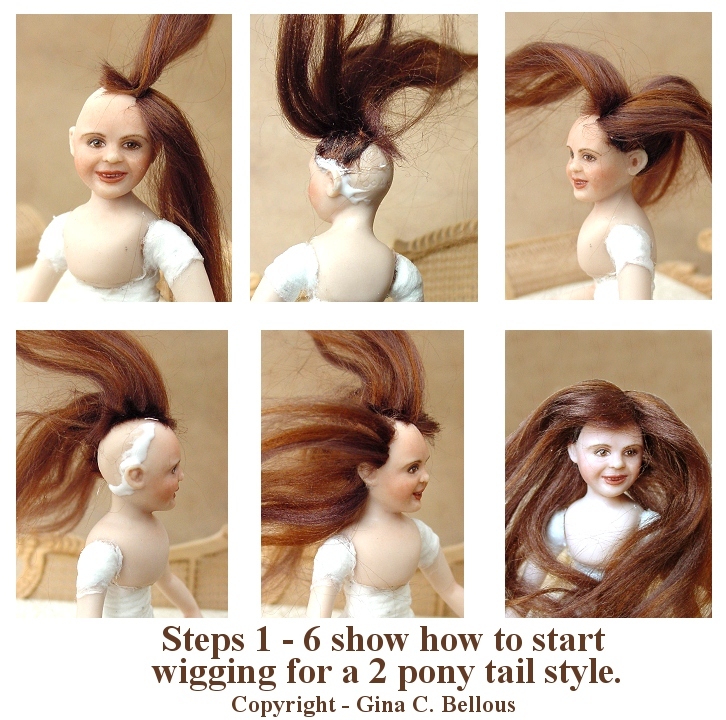 Here is a photo showing how I begin wigging for a 2 ponytail style. The hair is really more brown than it looks in the photo. Both girls will have side parts in their hair. Photo 1 - Run a seam of glue off center and lay 1 strip of hair along glue. Let set up and repeat for other side of part. Photo 2 - Run a seam of glue down 1 side in front around ear to base of skull. Photo 3 - Lay 1 strip of hair along this glue line. Let set up and flip hair up away from ear. Photo 5 - Repeat step 3 on other side of doll's head. (Not pictured) - Run a bead down back of dolls head to base of skull. Lay a strip of hair over this glue, let it set up, repeat for opposite side of hair. Let hair dry Completely! Photo 6 - Jocelyn has a mound of flowing hair which will soon be pulled into 2 ponytails! This is GREAT Gina! You photos are wonderful! Looking forward to seeing more! PS Love your beautiful blog.